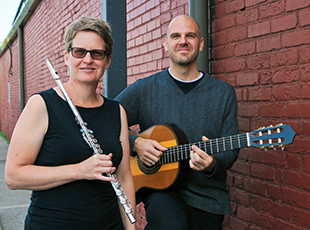 Classical guitarist Robert Gruca and flutist Linda White present a diverse program of music based on folk idioms from Eastern Europe and Japan. Composers include Serbian composer Dusan Bogdanovic, Hungarian Bela Bartok, Masamitu Takahashi from Japan as well as klezmer music written by America’s Carl Dimow. They offer an entirely new concert experience by alternating the best of the flute and guitar repertoire, their own arrangements of jazz and rock tunes with a short impromptus – improvised jams in a variety of styles that will make you want to join in. With each concert, a new experience unfolds which will take your ears and your imagination on a unique ride. Seating is limited for this special community concert; please arrive early! Freewill donation. Funding for gallery concerts is generously provided by the Paul M. Angell Family Foundation.